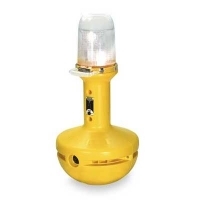 WobbleLight® is a self righting, highly durable work light that takes a severe beating from workers, vehicles, debris, and drops with no bulb breakage. WobbleLight® have self-righting bases. They bounce back from abuse, providing stable lighting. Internal ventilation system keeps light cool enough to touch, operates on 120 volts.